Went 2 the Bridge: White People: What Will We Do To Change Our Legacy Of Violence? White People: What Will We Do To Change Our Legacy Of Violence? 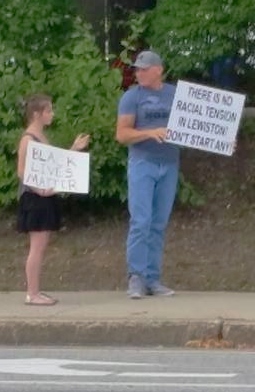 You may remember this photo of rising 9th grader Laykenn Kurtzer in dialogue with an older man who was protesting her monthly vigil for racial justice in central Maine. Their body language struck me as interesting and I wanted to find out more about what they said, so I contacted Laykenn for an interview. Laykenn said that they crossed the bridge because they wanted to ask what made him think that there was no racial tension in Lewiston. "He was kind and willing to talk to me; he was very civil about it," said Laykenn. "I went over because I just wanted to talk, not argue." Besides repeating "all lives matter" several times, Laykenn reports that the man's main point was that the vigil was in the wrong place. "He said that we should be standing in front of a police station where cops have killed black people without getting in trouble, or having any charges brought against them. He said that cops aren't bad but they should be getting punished. He told me he would go with us and hold a Black Lives Matter sign to protest at a police station in another city." I wondered if they asked him if he has gone to any of those protests (there have certainly been ample opportunities) but Laykenn said no. Laykenn said, "I explained that we stand here because we are trying to get people to be aware of the Black Lives Matter movement." Their discussion lasted about half an hour, with the man circling back to his main talking points several times. Laykenn and mom Sass Linneken are regulars at the monthly vigil organized by the group Showing Up For Racial Justice, (SURJ) Central Maine chapter. Here they are standing on the Auburn side of the bridge to Lewiston in May, 2016. One thing that clearly disturbed them was when "a big pickup truck got really, really close to the sidewalk where we [i.e. the SURJ vigilers] were standing and blew out black exhaust all along the bridge. That was scary." Personally, I have seldom been at a demonstration for either racial justice or peace in central Maine without at least one large pickup truck aggressively creating noise and/or smoke in response to the messages displayed. I suppose the drivers think they are engaging in dialogue? Es hablando no matandonos como habremos de entendernos. In case you're wondering why I didn't interview the man in the photo, too, I have a couple of reasons. At first I did not know who he was (nor did Laykenn), then another SURJ member contacted me to say that he is a local minister who leads a group called the Jesus Party along with his wife. (Laykenn said there was a woman standing with him holding a sign that said something about god that they can't exactly remember. Laykenn did not speak with the woman.) After my sister Hope did some internet research I found that this man is often online complaining that no one listens to his "all lives matter" message. Laykenn listened, but since my blog does not exist to promote hateful messages I decided not to attempt to interview him. That is one of the things I will do as a white person who wants to change our legacy of violence. What will you do?